There was something different about Tasting Plates (presented by Vanfoodster) this time around... First, it was not in Vancouver (this wasn't the first time though). In fact, it was on the other side of the Lion's Gate in West Vancouver. Second, the skies opened up pretty good (unlike most other times during Tasting Plates). 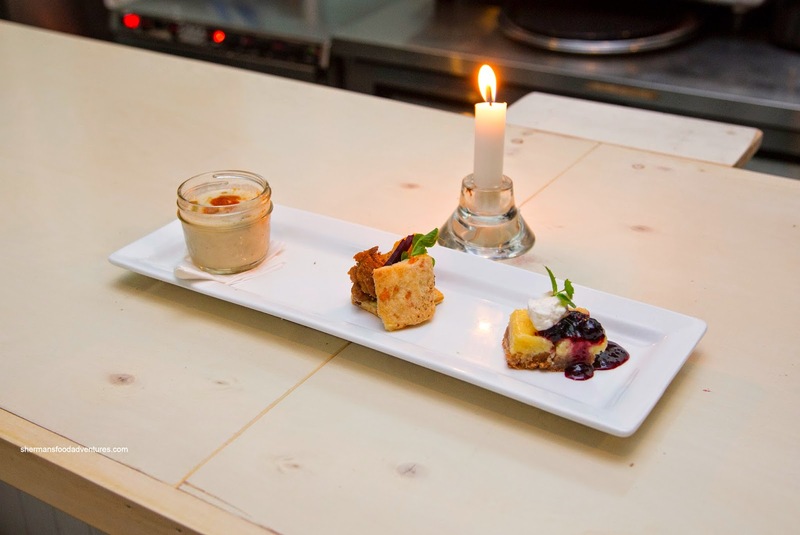 In actuality, Tasting Plates is daring to go where others haven't. Ironically, I missed the Richmond one (I was away I swear! ), now the only one missing is Surrey (c'mon Richard, you know you want to...). But back to West Van, my angle of attack was to arrive super early (ahead of rush hour traffic). Whipping Girl followed suit and we were on our way as others hadn't even arrived yet. 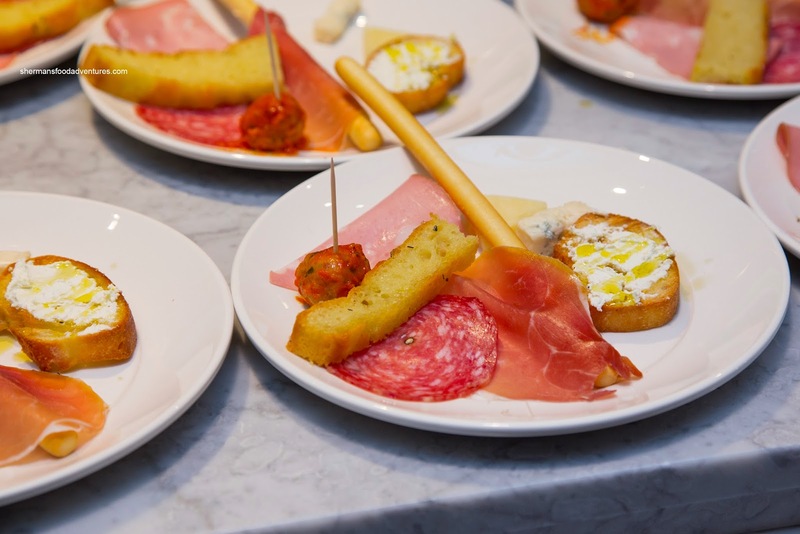 We were served an Antipasto Sampler Plate at Caffe Al Mercato comprised of prosciutto, salami, mortadella, focaccia, meatball, gorgonzola, taleggio, ricotta on crostini and breadstick. Amazingly, the one thing that I really liked was the the light and crispy breadstick. It wasn't as if the other items weren't good though. I thought the meatball was firm without being dry. 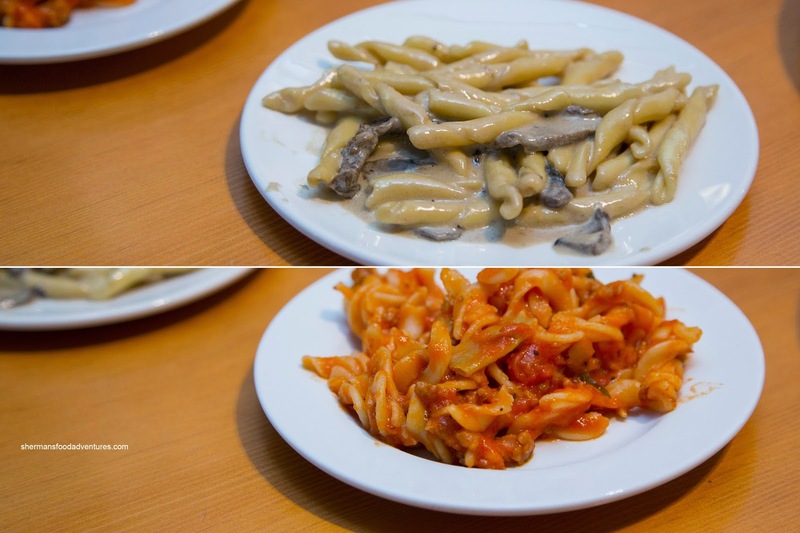 We also got to sample 2 pastas from Mangia E Bevi at the same location (as they are the same company). The first was a Strozzapretti with white truffle oil, portobello mushrooms and porcini-cream sauce. I thought the mushrooms were impactful in amping the woodsy-flavour of the cream sauce. Although the truffle oil provided even more Earthiness, it was a touch strong. Since it was served in a chaffing tray, the pasta could be excused for being a bit past al dente. Next was the Gluten-Free Fusilli with ground chicken, artichokes, oven-dried tomatoes and brandy-tomato sauce. Again, the pasta was soft due to the serving method (but understandable). I thought the flavours were bright and tart from the artichokes while the chicken was able to replicate a meatiness more associated with pork. We moved on next to Truffle House and Cafe where we were served a plate consisting of Truffle Arancini (mushroom risotto ball with Parmesan and truffle aioli), Air Dried Cherry Tomato Pinwheel (with sundried Moroccan olive tapenade) and Chocolate Mousse Cup (with honey almonds and raspberry coulis). Scorching hot and super crispy, the arancini featured firm rice that was effectively salty without being overwhelming. There was a nice hit of truffle and mushroom that lived up to the restaurant's namesake. As for the pinwheel, it was a touch burnt on the bottom, but not enough to adversely affect the flavour profile (it was super nutty though). The puff pastry was crispy and light while the tapenade and tomato combined for a tart saltiness. 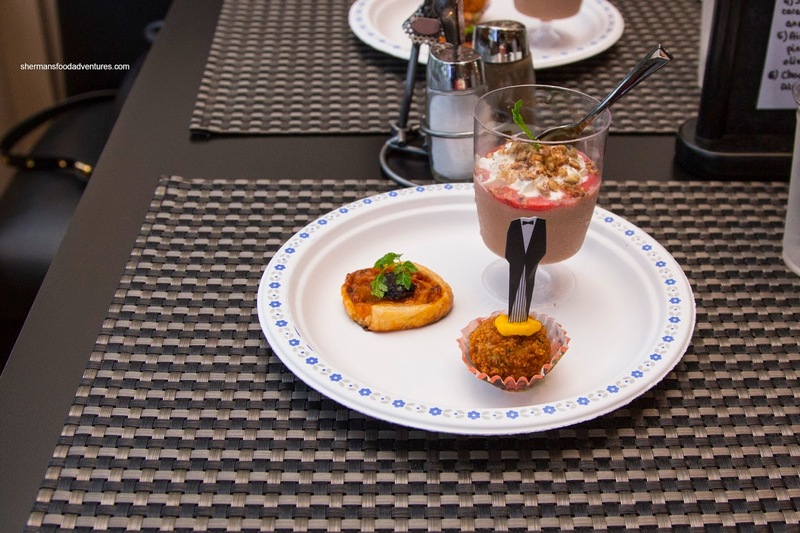 The weakest item of the dish was the mousse cup as the consistency was too thin while there was too much overpowering coulis that rendered the chocolate to the background. Onto our next stop at Blue-Eyed Mary's, we were treated to a platter comprised of Corn, Leek and Sausage Chowder, Multi-Grain Crusted Chicken Thigh (with Riesling apricot butter on a bacon cheddar biscuit) and Lemon Basil Tart (with almond sable crust and late summer berries and cassis compote). Loved the chowder as it wasn't too heavy, but was still full of flavour and body thanks to the sweet leeks and corn as well as the meaty sausage. Unfortunately served cold, the chicken thigh was nicely textured with a firm crust. I liked the sweet apricot butter but the cold biscuit made things heavy and clunky. The impactful basil in the lemon curd made for a refreshing tart. A bit too sweet, the compote took away from the curd a bit, but the crust was really good as there was a nuttiness to it. Our tasting plate at Milestone's was probably one of the worst we've had ever for one of these events. 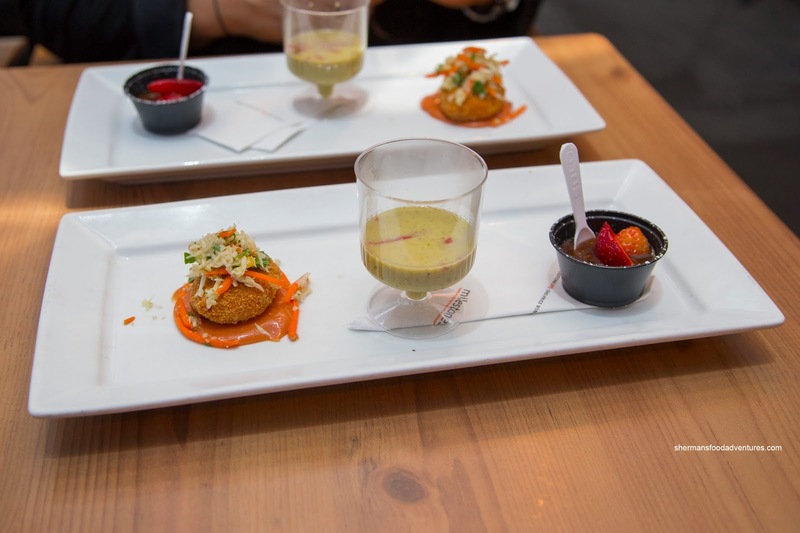 It included Panko- Crusted Crab Cakes (with sriracha slaw and chipotle aioli), Poblano Soup (with creme fraiche and red corn tortilla) and Peanut Butter and Jelly Pot de Crème. We were not sure what the heck they did with the crab cake, but the exterior panko coating was rubbery with the texture like overcooked eggs. That completely negated the fluffy blue crab. This was one bad crab cake. As for the soup, there was an effective spice and some sweetness, but the overuse of salt overwhelmed even the spice. Lastly, the pot de crème had this strange aftertaste where it was too sweet. We would've liked to see some bitterness. Suffice-to-say, we didn't finish the food. Literally running away, we headed over to The Anchor Eatery where we tried 2 juices including the Green Machine (kale, cucumber, celery, parsley and apple) and Honolulu (pineapple, apple, mint and ginger). 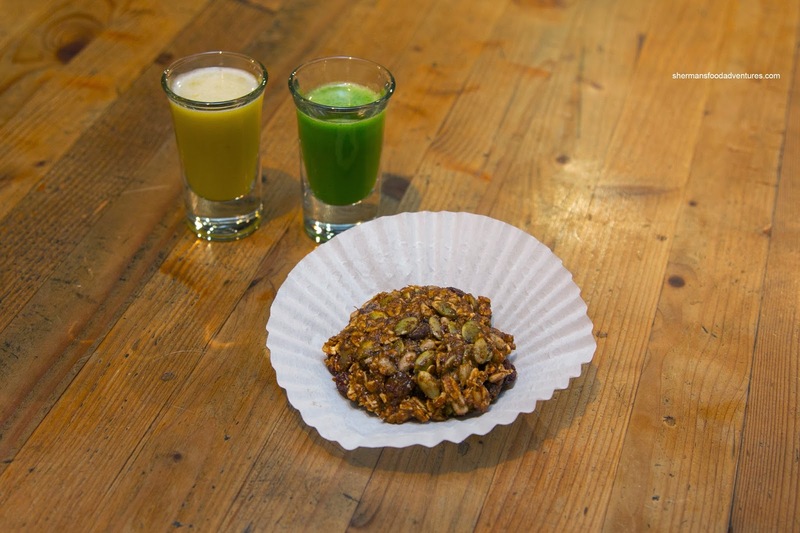 I liked both of them as they were healthy and refreshing while sporting enough impactful flavours. We also tried their Wheat-Free Vegan Cookie which was chewy and chocolaty where it wasn't too sweet. It resembled a granola bar in texture. We planned for Temper Pastry to be our last stop as it was effectively our dessert course. 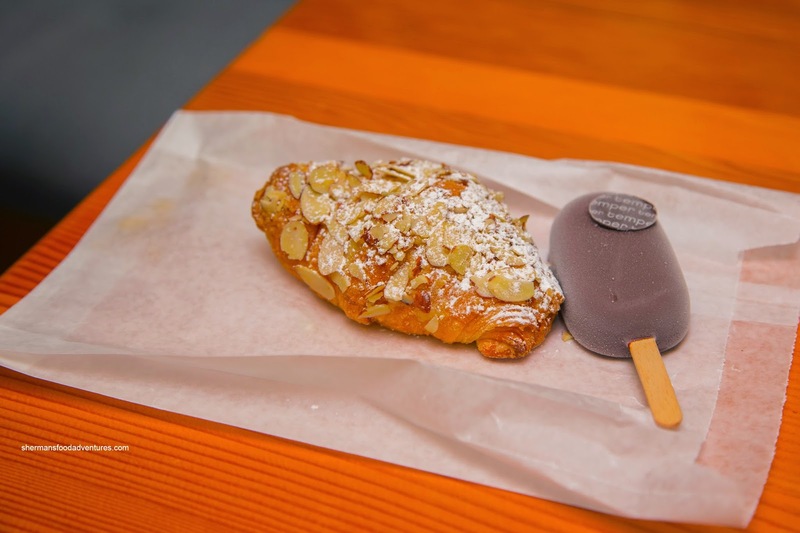 We each chose a different item which included a Double-Baked Almond Croissant and a mini-Chocolate Ice Bar. With a lightly crisp exterior and a buttery sweet filling, the croissant was satisfying and purposefully sweet. We loved the ice cream bar as it was only semi-sweet with a slightly bitter finish. The ice cream was light and creamy. 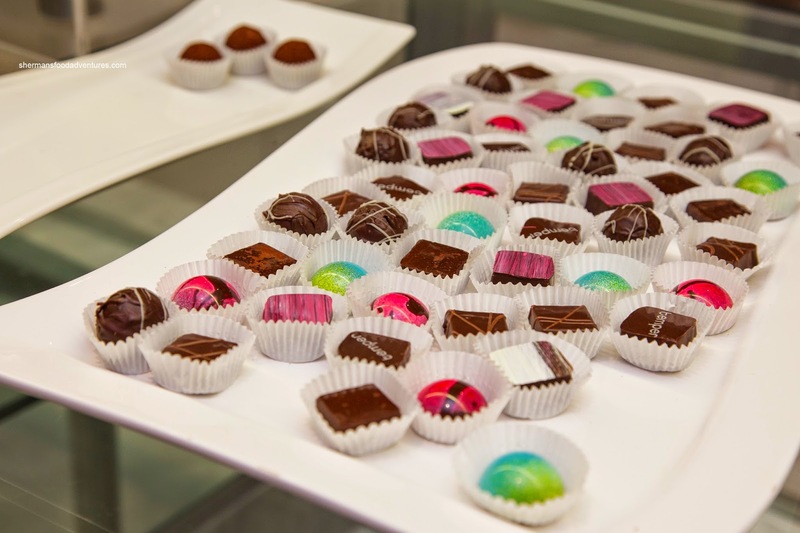 I was also able to sample one of their chocolates and it had a nice silkiness while finishing off semi-sweet and a touch bitter. Overall, this was a nice gastronomical introduction to West Van and in particular, places that I've never heard before. Again, I appreciate events such as these that dare to go to places not many would think of. Naturally due to the restaurants willing to participate, the distance between them made it a driving tour (but they were on the same street though).